Honey is a bee product that can be found at most supermarkets around the world. Since ancient times, honey has been applied to cuts, wounds, and burns to promote proper healing; supposedly even Hippocrates used honey on wounds. Records on the use of honey exist in different medical practices, including Ayurvedic medicine, ancient Roman medicine, and Chinese medicine. In the past two decades, there has been an increasing trend of using honey on wounds in place of traditional wound dressings. Honey has various properties that give it the potential to be an effective wound healing agent. Honey was discovered to possess natural antibacterial activity by producing hydrogen peroxide in tissue. [6,7] Further healing action has been demonstrated by honey in studies showing its anti-inflammatory capabilities and antioxidant activity. Considering these promising properties, two recent reviews evaluate the clinical evidence of using honey as a wound-healing agent in humans. In two systematic reviews that attempt to summarize all relevant evidence in the literature at once, it appears that honey may be a reasonable treatment for burn wounds, but other wounds currently have insufficient evidence. [9,10] Out of five clinical trials, three demonstrated that wound dressings soaked with honey are better than conventional dressings in healing ulcers in people with diabetes, while the other two studies showed that honey may be a potentially safe alternative. Ten observational studies all reported that honey was better than conventional wound dressing. Unfortunately, none of the studies that were included in this review were blinded. In addition, the studies used different measures of effectiveness, and the data was overall of poor quality. In general, a great deal of caution should be used when accepting the recommendation of a research study. For example, if a study is not blinded (meaning that the patients and caregivers know who is in the control group of the study or in the intervention arm), a great deal of bias can be introduced to the study. For example, knowing they are in the control (placebo) category, some patients may secretly treat their wounds with an additional dressing. This will completely change the results of the study making the intervention seem to not be beneficial. In another review, the authors systematically searched all the medical literature for studies that evaluate the use of honey for all types of wounds (rather than only diabetic foot ulcers as in the previous review). Additionally, their search was limited to only randomized clinical trials and not observational studies. Generally, randomized trials are considered more powerful compared to observational studies. The types of wounds in this review included diabetic foot ulcers, venous leg ulcers, burns, infected post-operative wounds, pressure sores, cutaneous Leishmaniasis (a type of infection), and gangrene. In this study, the authors used a specific scoring system to objectively examine the quality of the evidence in each trial. The authors concluded that “the effect of honey on diabetic foot ulcers cannot be determined,” due to small sample sizes and poor data quality. Two studies in this review paper earned acknowledgment for demonstrating the potential of honey in the management of burns and infected wounds following surgery. [11,12] In summary, the authors concluded that it was not possible to make an overall conclusion on whether honey is helpful to wounds. The authors emphasized that the studies lacked data on quality of life of participants and cost-effectiveness of using honey – which are important outcomes to consider for “real-life” application. 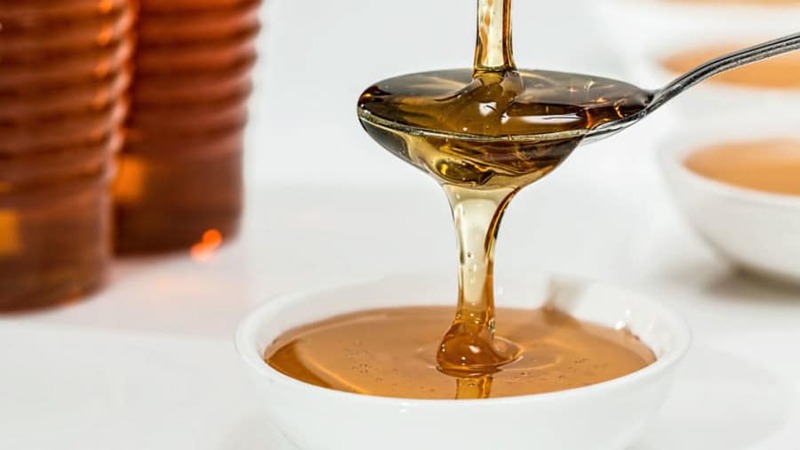 Further look into the details of the studies included in the review also revealed that the actual types of honey used was unclear – an all too common problem in alternative medical interventions. Both reviews have the overarching conclusion that no true statement can be made on the effectiveness of using honey to promote wound healing. The studies have found that the use of honey on wounds appears to be safe. However, when considering all the information produced from the research done, it cannot be determined if honey is beneficial for wound healing. Until more definitive studies are conducted, here are a few common sense tips: Before using honey on wounds, consider testing it on a small area of skin first as a few people can have allergic responses to honey. It also makes sense to use so-called “medical grade honey.” This simply means that the honey has been treated to eliminate bacteria and other contaminants. Warning and disclaimer: Honey should never be used on newborns or infants because of the chance to develop botulism poisoning (a potentially life-threatening condition). ​1. Hippocrates. On the articulations. The genuine works of Hippocrates. Clin Orthop Relat Res.2002(400):19-25; PMID: 12072741. 2. Johnson A. A short history of wound dressings: from animal grease and lint to hydrocolloids and alginates. Ostomy Wound Manage.1992;38(2):36-40; PMID: 1558634. 3. Hajar R. Honey from folklore to medical marvel. Heart Views.2002(3):180-188. 4. Fu X, Wang Z, Sheng Z. Advances in wound healing research in China: from antiquity to the present. Wound Repair Regen.2001;9(1):2-10; PMID: 11350634. 5. Jull AB, Rodgers A, Walker N. Honey as a topical treatment for wounds. Cochrane Database Syst Rev.2008;10.1002/14651858.CD005083.pub2(4):Cd005083; PMID: 18843679. 6. Namias N. Honey in the management of infections. Surg Infect (Larchmt).2003;4(2):219-226; PMID: 12906723. 7. White JW, Jr., Subers MH, Schepartz AI. The identification of inhibine, the antibacterial factor in honey, as hydrogen peroxide and its origin in a honey glucose-oxidase system. Biochim Biophys Acta.1963;73:57-70; PMID: 14000328. 8. Sharp A. Beneficial effects of honey dressings in wound management. Nurs Stand.2009;24(7):66-68, 70, 72 passim; PMID: 19927561. 9. Kateel R, Adhikari P, Augustine AJ, et al. Topical honey for the treatment of diabetic foot ulcer: A systematic review. Complement Ther Clin Pract.2016;24:130-133; PMID: 27502813. 10. Jull AB, Cullum N, Dumville JC, et al. Honey as a topical treatment for wounds. Cochrane Database Syst Rev.2015;10.1002/14651858.CD005083.pub4(3):Cd005083; PMID: 25742878. 11. Subrahmanyan M. Addition of antioxidants and polyethylene glycol 4000 enhances the healing property of honey in burns. Annals of Burns and Fire Disasters.1996;IX(2):93-95. 12. Al-Waili NS, Saloom KY. Effects of topical honey on post-operative wound infections due to gram positive and gram negative bacteria following caesarean sections and hysterectomies. Eur J Med Res.1999;4(3):126-130; PMID: 10085281.